No better way to show what Galway is all about. Last month, Mundy and Sharon Shannon took to the streets of Galway to lead a massive crowd in a version of ‘The Galway Girl’, the iconic Steve Earle song that the pair had recorded a wildly popular cover of in the mid-2000s. 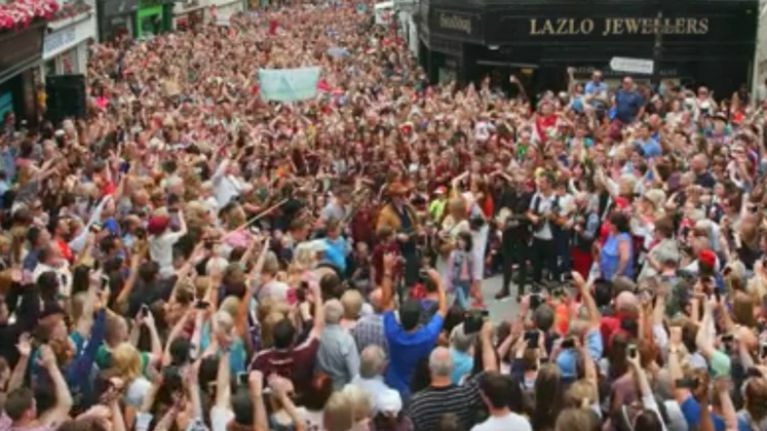 The event was held to promote Galway’s campaign to be named European Capital of Culture 2020 and it was a brilliant occasion, with the assembled crowds singing their hearts out and really getting into the swing of things. An official video, made by Kamil Films, premiered today, July 5, and it gives a great sense of the fabulous atmosphere that prevailed on the day, when a record breaking crowd of 15,000 came out to lend their support.